NEW YORK The Standard & Poor's 500 index closed within a short reach of its all-time high on Tuesday. Rising home prices and orders for manufactured goods drove stocks up from the opening bell. The S&P 500 index rose 12.08 points, or 0.8 percent, to close at 1,563.77. That's less than two points from the peak it reached on Oct. 9, 2007, before a recession and ensuing financial crisis battered markets. "Unless something major comes along to derail this rally, it just seems like the market is going to keep climbing higher," said Marty LeClerc, the managing partner of Barrack Yard Advisors, an investment firm in Bryn Mawr, Pa. 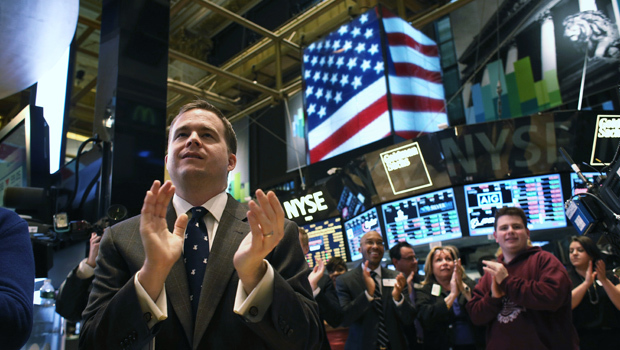 The stock market's gains were widely shared. All 10 industry groups in the S&P 500 rose, with health care and energy companies leading the way. Smaller companies lagged behind the biggest ones Tuesday. The Nasdaq composite rose 17.18 points, or 0.5 percent, to 3,252.48. And the Russell 2000 rose 3.97 points, or 0.4 percent, to 949.82. That's roughly half of the S&P 500's gain. Big company stocks and small-company stocks often part ways, said Jack Ablin, chief investment officer at BMO Private Bank in Chicago. Big corporations generally have stronger ties to Europe, and their stocks wavered over the past week as traders kept an eye on negotiations to rescue Cyprus. By contrast, smaller companies are less exposed to the rest of the world. "That's part of the reason small-caps have outpaced the market this year," Ablin said. The S&P 500, used by investors as a proxy for the overall market, is up 9.6 percent so far this year. The Russell 2000 has fared better, rising 11.8 percent. Netflix surged 5 percent, leading the S&P 500, after an analyst at Pacific Crest Securities said the stock will likely climb as the company adds subscribers. Netflix's database of its members' viewing habits should give it an edge in creating new shows and draw more people to sign up for the video-streaming service, the analyst said. Netflix rose $9.82 to $190.61. Housing prices rose in January at the fastest pace since the summer of 2006, before the housing bubble popped. The Standard & Poor's/Case-Shiller 20-city price index climbed 8.1 percent in the 12 months to January. That compares with a 6.8 percent increase the previous month. Prices rose in all 20 cities, led by Phoenix. The economic reports out Tuesday added to evidence that the economy is slowly improving, and that's exactly what many investors want right now, LeClerc said. Slow growth means it will take a while before the Federal Reserve starts unraveling its bond-buying program and raising interest rates. Drive-in restaurant chain Sonic (SONC) jumped nearly 10 percent after reporting that its quarterly earnings more than doubled. Sales were flat but Sonic said its expects them to improve in the year ahead. Its stock rose $1.14 to $12.87. Supervalu (SVU) rose after it announced a plan to lay off more than 1,000 people, roughly 3 percent of its workforce. The supermarket operator said its recent sale of five grocery chains means it needs fewer workers. Supervalu's stock gained 7 cents, or 1 percent, to $5.12. Children's Place Retail Stores (PLCE) sank 1 percent after the company reported weaker quarterly earnings. The retailer also said bad weather would crimp its sales. The company's stock lost $1.48 to $44.51.